For Rio Ramirez, the road to the UM Sports Hall of Fame may be one of the longest ever traveled, with many twists and turns, but plenty of success along the way. In his hometown of Camaguey, Cuba, Ramirez began diving at age six at boarding school, eventually becoming the Cuban National Champion in the 3-meter springboard and 10-meter platform. At age 16 in 1991, Rio won the first international meet in which he competed for Cuba, by claiming the Gold medal in the 10-meter platform at the Pan American Games held in Havana, Cuba. In 1993, he defected to the United States at the Caribbean Games in Puerto Rico with $13 in his pocket, making his way to Miami and learning English by listening to music and going to night school. 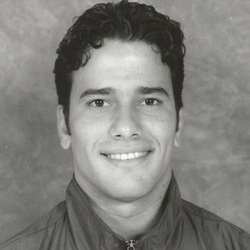 After enrolling at Miami in 1996, Ramirez instantly became one of the best divers in the country, capturing the NCAA Individual National Championship in the 1-meter three times, from 1997-99 and the 10-meter platform in 1999. Rio was a five-time All-American and was named the 1998 NCAA Diver of the Year when he won the 1-meter springboard, finished second in the 3-meter springboard to teammate and UMSHoF member Bryan Gillooly, and finished eighth in the 10-meter platform at the national championship meet. He claimed back-to-back NCAA Diver of the Year awards in 1999 when he won the NCAA titles in the 1-meter springboard and 10-meter platform. Ramirez also won 6 Big East Conference titles, winning the 1-meter and 3-meter springboards all three years he competed and held conference scoring records for both competitions when he left Miami. Possessing an attitude that each year was a clean slate to be started fresh, this approach kept Rio grounded and hungry for success. He is proud of being mentored by an outstanding coach, UMSHoF member Randy Ableman, and that he and his teammates supported each other, regardless of how competitive they were in meets. Ramirez graduated Miami with a Bachelor's degree in Business Administration. The list of accomplishments associated with the former USA Diving Team member is extensive and includes a USA National Championship in synchronized 3-meter diving (2000), a first place finish at the FINA Grand Prix in the 1-meter (2000) and a third place finish at the 2000 Olympic Trials. He holds the NCAA Championship record (1990-99) in platform diving with a score of 901.60. After his diving career ended, Ramirez was selected as a cast member of the Cirque du Soleil production of "O" in Las Vegas (2004-2007) where he performed acrobatic rolls and high diving as one of the main characters in the show. He also spent a year as the Lead Acrobatic Diving Coach at The House of Dancing Water, a Franco Dragon production in Macau, China. Currently in his third season as Head Women's Diving Coach at Florida International University, Rio has been named Coach of the Year twice, in the Sun Belt Conference (2013) and in Conference USA (2014).